The metropolis is a site of endless making and unmaking. 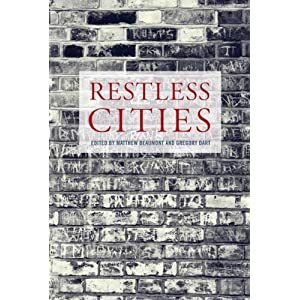 From the attempt to imagine a “city-symphony” to the cinematic tradition that runs from Walter Ruttmann to Terence Davies, Restless Cities traces the idiosyncratic character of the metropolitan city from the nineteenth century to the twenty-first-century megalopolis. With explorations of phenomena including nightwalking, urbicide, property, commuting and recycling, this wide-ranging new book identifies and traces the patterns that have defined everyday life in the modern city and its effect on us as individuals. Bringing together some of the most significant cultural writers of our time, from Iain Sinclair, Chris Petit and Geoff Dyer to Esther Leslie, Marshall Berman, and Patrick Keiller, Restless Cities is an illuminating, revelatory journey to the heart of our metropolitan world. Contributors: Matthew Beaumont, Marshall Berman, Kaisa Boddy, Iain Borden, Rachel Bowlby, Gregory Dart, Geoff Dyer, Patrick Keiller, Esther Leslie, Michael Newton, Chris Petit, Michael Sayeau, Michael Sheringham, Iain Sinclair, David Trotter and Mark W. Turner. There will be a panel discussion featuring the editors as well as Marshall Berman, Geoff Dyer, and Ian Sinclair based on the book at the Whitechapel Gallery on 10 June at 7 pm.